Artful Affirmations: My Big Summer Surprise! I LOVE THAT SHOW! Terri.. How wonderful amd what luck to have been there at just the right time. I am sure he is a very nice, polite person (unlike the part he plays). I am sooooo excited about there being another season. I suppose 'we' Americans are going to have a long wait to see season #5. UNLESS... Someone uploads it to YouTube before the DVD comes out. I have watched each episode twice on Netflix. It is such great humor, such beautiful scenery! And either he's REALLLLLY TALL or you are REALLLLLY SHORT! What an adorable photo of you with him....one to hang on your wall. The Port is divine....I hope to get there one day as my ancestors are from Cornwall and it would be a thrill to see it in person. I MUST find the DVD's to this series since you speak so highly of it. AND, it's Cornish so it's bound to be a great one. Cheerio! Too Cool!! 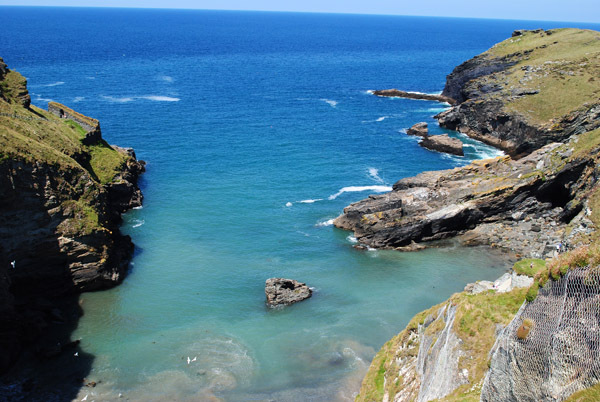 I love watching Doc Martin! How exciting! Thanks for sharing your adventure! 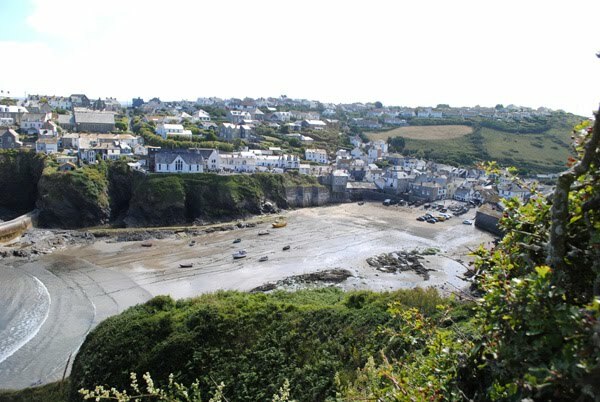 I soooo love this show and I too have been to Port Issac!!! 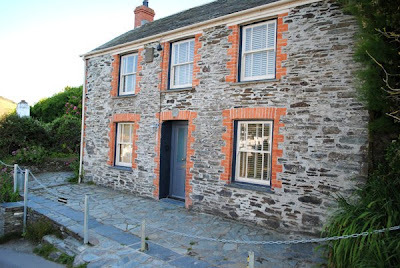 We were there in 2006, I have a photo of my husband (David) sitting on the steps of Doc Martin's surgery....we thought that was a 'big think'....but to actually be there while they were filming must have been amazing for you! I look forward to the new series!!! !It is such a beautiful little village, I look at my photos often. Oh my!! I have never seen this show, but you have peaked my interest for sure. How do I find it? I am so happy you got to meet and talk with him. And that picture!!! So adorable with tiny you being hugged like that. I'm so glad you had this wonderful experience! I don't know this show))))))) views on the photo are very beautiful! I know he is important to you,but i have no idea what the show is.But,that doesn't matter..what matters is he is important to you and you got to meet him and have your picture taken,,wow!!! how fabulous!!! How fun to meet him in person and find out what a nice fellow he truly is!! Wonderful photos! How much fun for you! Wow, how exciting that must have been for you! 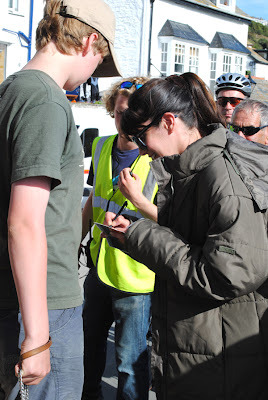 Love Doc Martin! It sure would have been a Big Surprise running into him. Thank you so much for sharing we love that show too and have wondered what the little town was really like. It looks lovely! Oh I love Doc Martin! I heard that another season was coming. I'm so glad that it's really happening. How lucky for you to have met him! What a gorgeous place. I would love to visit. Lucky you!! 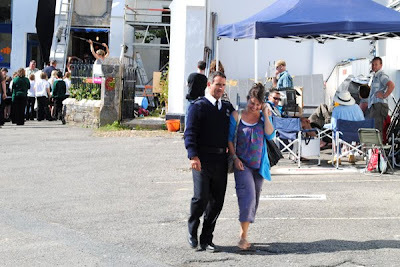 That's one of my fav shows too, altho I'd like to strangle him on a regular basis ;) How exciting to be there during filming and especially to get a snap with 'the doc'. I don`t know that show, here from Denmark. The Port looks wonderful, and so picturesque. How exciting! Fun...I would love to meet David Tennant = The Doctor from Doctor Who!! What a great thrill.. I must say, he's one of the actors I would have to approach, have heard him interviewed a handful of times and he really does seem lovely. Perfect timing for you, what a great day! This is exciting! So lovely you were able to be there to watch and to enjoy meeting him! I can tell you had a marvelous time!What a great experience! OOO! I know that fella! A favorite nutty character on Jeeves and Wooster - Balmy Phungy Phipps - wow - I'm sure I didn't spell that correctly - can't say I've ever really noticed how it was spelled in the credits. He was a hoot playing the character the first couple of seasons back in the '90's. Yes, He went onto do many other series - which I've not seen - but he is a familiar and welcome face in BBC in our home. Awesome England adventures. Maybe someday, for me, too! OMG..Terri..I had no idea you were a Martin Clunes fan..LOVE the Doc myself...YAy!! that was such fun..you lucky lucky gal..he is pretty amazing! THanks for such a mega-treat..WOW!! Totally I know Doc. Martin! Wonderful. What a kind man he is judging by your delightful report. An actor who can graciously drop character for the love of fans is indeed an angel. What a lovely time you had, Girl! OH MY GOSH! I love that show and am tickled pink that they are still filming...I too thought it had ended. I am green pea envious that you got a picture with "HIM"! I adore Martin Clunes...he is handsome, tall and hysterical funny. Have you ever seen him in "Men Behaving Badly"? It was when he was younger but still the same wit and good looks, well, I think he is adorable anyway! Terri....one of my favorite shows!!!! I AM GREEN WITH ENVY! How fun. Can't wait to share this with my hubby! P.S. Word verification is shoone which looks a lot like swoon! Oh My God....He is one of my favorites. I watch those shows over and over. I knew there was going to be another season, but was not sure when we would be able to see it. Now, I look forward to seeing it sooner rather than later at least. Thanks so much for sharing your good fortune. 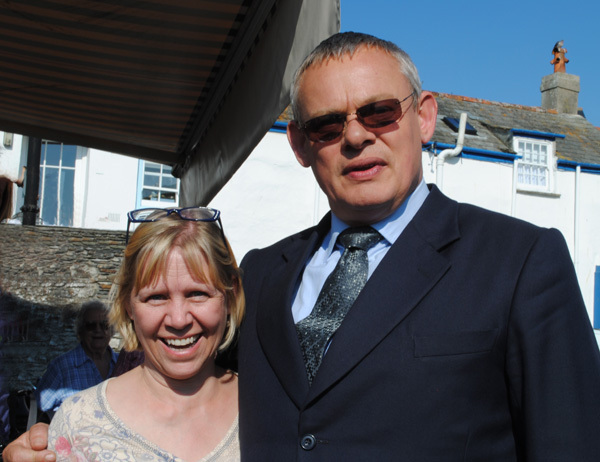 The scene of a lifetime... You with Doc Martin/Martin Clunes! As Mrs. Tishell said, "I could eat that man with a spoon" lol. I bought the soundtrack and regularly watch the episodes on Netflix, thank you for letting us share your experiences here. OH! MY! GOSH! Can you hear me screaming?! I know who he is!!! How lucky for you! :) I just love that show too! I was telling my friend about Doc Martin yesterday! What a coincidence! Love the photos. What a delightful story! I don't know the show...although I do like British TV. He looks familiar to me. How wonderful that he was nice and kind to you and also to the older couple. That part is the best! Lucky! My mom watches that show every week. And of course I can't help but be drawn into it. Glad to know he's a nice person! I don't know this show, but you make me want to look for it! How cool for you. The setting is simply magical! Oh Terri of course I recognize "Doc", I faithfully watch that show on PBS every Sunday afternoon and I too am thrilled to hear there will be another season! Even though I could not see all the photos you posted (Blogger's fault I am sure) I loved the ones I could see! Definitely my kind of village...sigh. HA HA I recognized you immediately ... and of course Dr. Martin too... Sweet photograph... I too enjoy his personality on the show. I'm glad looking at your photo. Nice photo of the two of you. Oh wow Terri....thats such a great story! We are going to Port Isaac in 2 weeks time....I wonder if they'll still be filming?!!! We don't actually have regular TV at our house...but we watch Netflix. My kids and I were hooked on the Doc Martin series!! I am so glad to know there is another season. I will tell you the character he played..and the rest of the cast were just awesome!! Wait till I tell my kids..they will love this.